If you spend much time at community meetings, or you’re a Leslie Knope fan, you know that public forums are often where open-mindedness goes to die. Here’s what Lindeke has to say. The heart of Mister Rogers’ show is an acceptance of difference, a kindness towards the surrounding urban world and the people that live in it. And in that, Mister Rogers seems like the antitheses of so much of the conversation that happens in actual old-fashioned urban neighborhoods in places like Minneapolis and Saint Paul. If you actually go to a neighborhood meeting, people often seem consumed by knee-jerk negativity. You’re more likely to see Mister Rogers-looking cardigan-clad men and women rejecting the idea of having new neighbors. I like imagining a world where Mister Rogers runs all the community meetings, sits down with drivers upset about bicycles, or neighbors upset about parking, and talks about sharing. 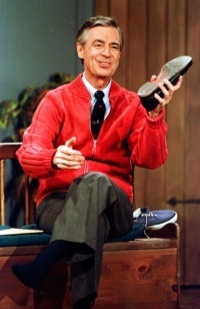 It might see naive, but I’d love if more conversations began with a bit of Mister Rogers’s attitude. Compassion instead of suspicion, the joy of appreciating a beautiful day, of trying new things, of being with other people in a neighborhood full of diversity. Mister Rogers was the anti-NIMBY. Elsewhere on the Network: More from Minnesota as Streets MN analyzes a schism among sustainable transport supporters; and Greater Greater Washington and WABA report that part of a critical DC bikeway could be out of commission for two years.